Thanks to the Affordable Care Act and insurance exchanges, millions of Americans are shopping for healthcare and comparing prices like they do at the supermarket or for auto coverage. How do providers adapt to this new dimension of healthcare consumerism? Take a cue from retail clinics. With nearly 2,000 “quick care” walk-in clinics in the U.S., major retailers like CVS, Walgreens and Wal-Mart are expanding their footprint by meeting the demand for more transparent, convenient and accessible healthcare. 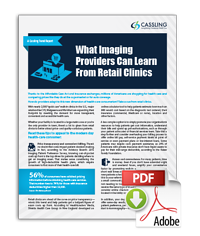 Whether your facility is located in a large metro area or you’re the only provider in town, there’s a lot to glean from retail clinics to better attract price- and quality-conscious patients.